Alpari, a global association of companies providing online foreign exchange ("Forex", "FX"), precious metals and CFD trading services, today announced a five-year title partnership with the World Match Racing Tour. The agreement sees the world’s leading professional sailing series become the Alpari World Match Racing Tour from February 2012. 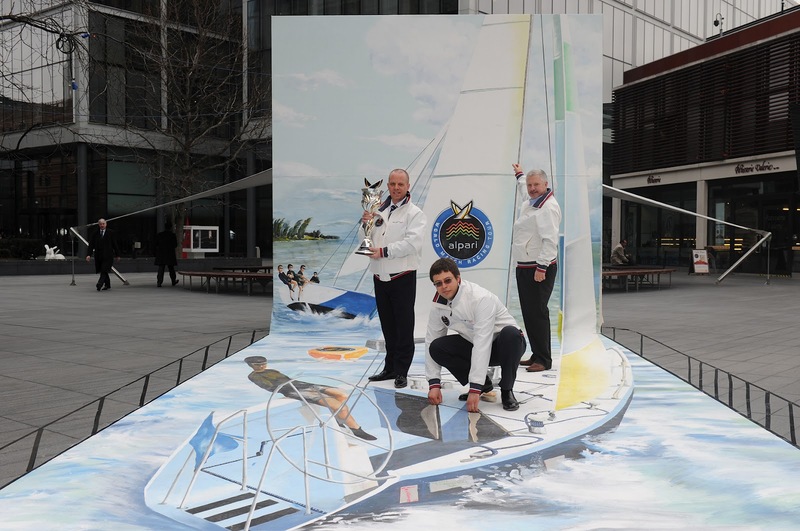 Jim O’Toole, CEO of the Alpari World Match Racing Tour, today joined David Stuart, COO of Alpari in the City of London to announce the title sponsorship. To mark the start of the partnership a unique 3D street art project, recreating a match racing scene of two boats going head to head in a winner-takes-all competition, was revealed in the City. Passing City commuters had their photos taken “on board” one of the boats. The deal will benefit both parties and is a timely boost to global professional sailing where other properties have struggled commercially against a backdrop of tough economic conditions. As a global sports series with events in North America, Asia and Europe, the multimillion-dollar partnership creating the Alpari World Match Racing Tour will help Alpari reach out to even more people across the continents and promote online trading to an even wider audience. David Stuart from Alpari added, “We are very happy to announce our partnership with the World Match Racing Tour. The Tour and Alpari have so much in common and we’ll both be strengthening our brands by entering into this partnership. The Tour appeals to an international audience and specifically to people who are ambitious and self-motivated. These are essential attributes of successful traders so Alpari’s services should excite them." The world’s best match racers will compete for the ISAF Match Racing World Championship and the largest prize purse in the world of sailing (US$1.75 million). Britain has enjoyed back-to-back success with triple Olympic gold medallist Ben Ainslie winning in 2010, followed by Ian Williams who captured his third world title in 2011. Williams is once again on the list of nine skippers, also announced today, to have secured a Tour Card for the 2012 season. Selected by the Tour, the list of Tour Card Holders includes a mix of current and former World Champions, Olympic and America’s Cup campaigners as well as an exciting breed of promising younger sailors from around the world. The Alpari World Match Racing Tour is currently increasing the number of Tour events to bring match racing and its star names to both traditional and emerging sailing countries. Today’s sponsorship announcement also coincides with the unveiling of the 2012 Tour Calendar which now includes a new event, the Chicago Match Cup in the US, to complement the other regattas in Germany, Korea, Portugal, Sweden, Switzerland, France, Bermuda and Malaysia.